One difference in living in a place compared to visiting is seeing it gradually change, compared to taking a snapshot at a given time. And while we always knew that Bangkok can be a fast-paced place, the changes even in our time here have been pretty noticeable, even just in the On Nut area where we live. Probably this in part says something about On Nut in particular developing quite quickly, and given it’s no longer the end of the line on the skytrain route (after its extension a year or two ago). But even on a small scale it’s interesting to watch the changes among the food stalls and in the On Nut night market next to the skytrain station. Sadly, the 20 baht store (where all sorts of household nicnacs cost under $1) didn’t stay for long after we arrived, but probably just long enough to sell through its stock and move on. 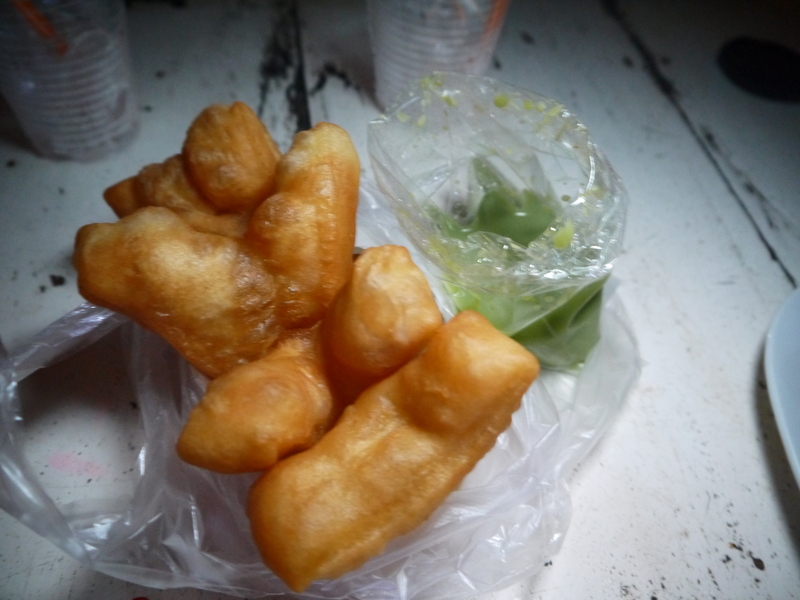 And a couple of months ago the Patongo fried donut vendor also moved on after being a regular dessert stop, while a made-in-front-of-you ice cream stall made an appearance for a few months and then disappeared one weekend. We were also a bit disappointed when the regular live band we liked stopped playing in the beer garden area although then we found that they’d only moved down the road to the “Best Beef” all you can eat Beef Buffet. It’s fair to say that this has probably been going on for a while, not just since we arrived! But new and exciting places have turned up, like the cake stalls (three slices for 100 baht) which have been popping up all over the city, and many of our favourites are also still there – the curry family who no longer try to steer us away from the spicy choices, the cocktail bar and the friendly husband and wife team selling Khao Mok Gai (chicken and yellow rice) and spring rolls in spicy sauce. Also do a good Khao Mok Gai and Curry with Noodles! On a bigger scale, it will be interesting to watch and see how things go as the area around us seems to be taking off, with six high-rise apartment buildings either recently finished or under construction, all within around 500m of the skytrain station. Apartment buildings in Thailand can take a while to fill up (and it’s always hard to know how many units are actually occupied) but new people should hopefully mean more new and interesting things in the area. I just hope that they all don’t come to our favourite Pad Thai stall, which must be on the brink of going national, now that the usual wait has reached half an hour with no sign of any less popularity!